My form was wroking well until tonight when I had tried to make changes using jot form builder some how all functionality of the form was frozen and stop working such as pop up text massage and also validation stop working so I have no clue what was happning this started after 6PM could some one help please I do not want my work to be waisted. You have quite a lot of forms in your account. Would you mind telling us which one is giving you problems? Also, is this form used as standalone, or is it embeddded somewhere? If embedded, kindly give us the URL of the exact page where it can be found. We would love to help you solve this issue the soonest time possible. Please respond to this message promptly. Thank you! review in the jotform builder as I can on my testing server. > just do not know the reason this happened. > the amount was $450.00. First off, I can't find a Price Quote form in your account pasha1. Could this form be in another account? 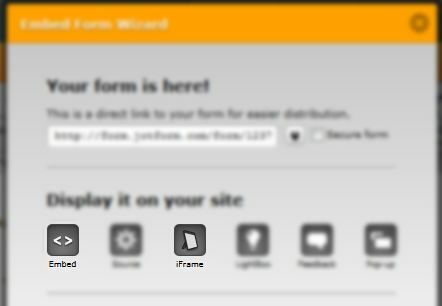 When you test the form from within the form builder, everything works perfectly. However, after embedding it to a page being edited in Dreamweaver, it seems to have lost functionality such as validation. If this is correct, would you mind giving us the URL of the Dreamweaver-edited page, if it is already uploaded? Have you tried using Embed or iFrame methods for embedding the form? If not, please try it. As for transferring the files to a new JotForm Licensed installation, please send an email to contact@interlogy.com so you can be assisted with this issue. correct. I took care of it anyway. It is good to know that you were able to resolve your issue. If in any case you have other questions or concerns, please do not hesitate to post a new topic here at the forums. We will be here to assist. Thank you for your concern, I will do so.